I first shared this with those I send emails to on a regular basis. Make sure you’re on that list to get other great articles like this when you most need it. [Link] But I wanted to share a bit about waiting on the Lord and what waiting does for our faith. “Oh really, what’s going on at the church?” I said. “Oh I don’t know, just a lot I guess.” she replied. My friend isn’t shy, she just couldn’t come up with how to answer. Her busyness had rendered her unable to share with one another. Unable to be present with me in the moment. She was more concerned with being and looking busy than being and looking effective. I think I am a lot like my friend too. I find comfort in the busy, I find a home in the crammed schedules and I seem to take shelter in the never-ending to-do lists. As if we really want a non-stop to-do list?! We avoid moments of solidarity and silence because we’re so uncomfortable in those state of beings. We avoid moments of solidarity and silence because we’re so uncomfortable in those state of beings. The world around us is extremely loud. There’s no escaping that. Too often, this noise that surrounds us, makes it incapable to be silent and impossible to wait. But it is something we must pursue. At church on Tuesday (that’s when those who work events on weekends go to church in Nashville) we sang the Christy Nockels song Waiting Here For You. Like many of you, I find I often sing songs and don’t think about the intentionality of the words. In that moment, I began to wonder (like my ADHD mind often does) Why are we waiting for Him? Related Posts: Stop Saying "I'm Busy"
Think about it — Jesus is… well… JESUS, He’s both omniscient and omnipresent. He doesn’t wait on me, I’m supposed to wait on Him right? Doesn’t he know exactly where I am at all times? He’s very active in my life, I see it almost every day. It’s not like he has this massive to-do list to finish before he spends time with me. It’s an interesting thought to consider. So today I scoured the scriptures for all the times people were waiting on Him. Noah waited on God’s sign of protection as the waters receded in the flood. Moses, waiting on the mountain before God gave him the Ten Commandments. Ruth encouraged waiting for the Lord’s direction, Job’s entire life was waiting on the Lord in his season of pain and despair. And then there was Jesus, only Jesus. If anyone knew waiting, it was Jesus. First, waited to begin ministry. Waited for the disciples, waited to do his first miracle, waited (in agony) for the cross, waited (in darkness) for the resurrection and wait for the Holy Spirit to come in His place. All throughout the bible there are moments where we are called to wait on God, sometimes in silence and sometimes in agony/darkness too. When we wait, something amazing happens. Expectation begins to break walls down, our hearts begin to open up and the noise around us begins to settle down as we begin to discern that still small voice. God doesn’t whisper because He wants to be difficult to hear. God doesn’t whisper to be difficult. He whispers so we lean in & draw near. The end is always more pure after a healthy wait. Gifts are more beautiful because we’ve been patient for Christmas morning. And Jesus’ presence is more life-changing when we’ve waited for Him. I’m curious, what are you waiting for? When we wait, let’s wait with expectancy. God will always show up. When we wait, let’s wait with urgency. God is always quick to answer. When we wait, let’s wait with intensity. Evil hates an unwavering faith. When we wait, let’s wait with courage. God will move mountains and do what He alone can do. The truth of the matter is this… waiting isn’t for God and it isn’t waiting for Him to finish his other chores and find us sitting in the corner. Waiting for God is the process of calming our souls to a point where we realize He’s been in the room with us the whole time. Waiting for God is slowing down (not looking so far up to the next task or project) realizing God is sitting beside us yearning for us to be present for us to experience His presence. The busy lives we think we crave rob our intimacy with God. Do the busy lives we think we crave, actually rob our intimacy with God? I want to fight that busyness more. I am learning and reminding myself, even now, that our waiting and our silence is where God resides. I want to be present in his presence. In waiting, we hear a louder whisper. In waiting, weakness is strengthened. In waiting, fear is overcome by hope. In waiting, Jesus is encountered. p.s. 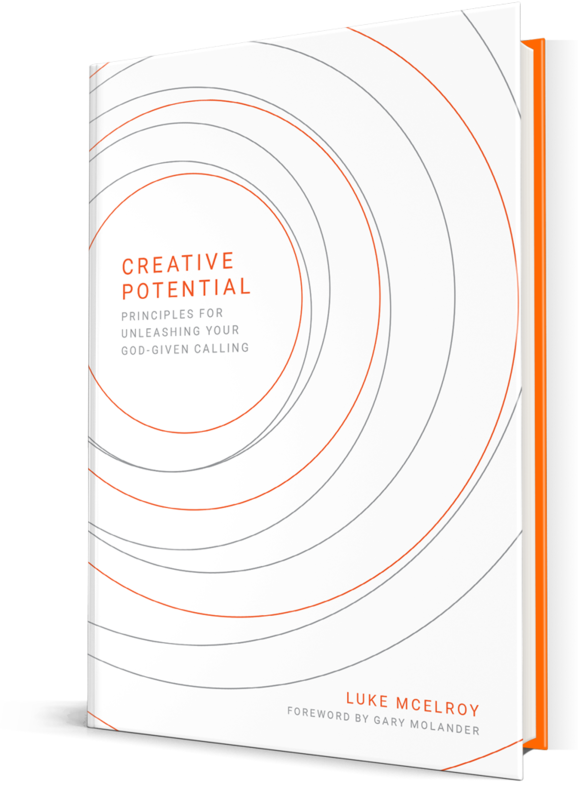 If this spoke to you, I’d encourage you to check out my latest book, Creative Potential. Click here to learn more about it and see how you can find your calling and step into your purpose!